Most of you know this is my daughter's second year in school. Last year they we made Valentine Boxes for them to store their valentine goodies in. I was especially proud of our Princess Castle Valentine Box. This year they are making them at school, but we are still sending in Valentines for the kiddos to pass out. I have decided this year to do something extra special and pass out PEEPS®! 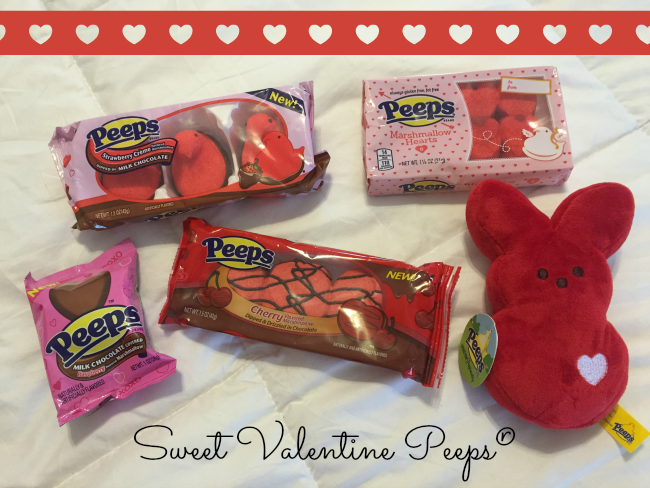 PEEPS® has so many great Valentine gift ideas for anyone who you'd like to show some extra special Valentine love to this year. - PEEPS® Valentine Hearts: Express your love with eight sparkly red marshmallow mini hearts. This new item is adorned with a write-on tag for personalized gifting! - PEEPS® Chocolate Dipped Strawberry Crème Flavored Chicks: Three delectable strawberry crème flavored marshmallow chicks dipped in smooth milk chocolate – perfect for the ones you love. - PEEPS® Marshmallow Hearts: Available in 2 or 6 count packages, these pink heart shaped marshmallow hearts help show your sweetheart that you do know the way to their heart! - PEEPS® Strawberry Crème Flavored Marshmallow Hearts: Nine red marshmallow hearts with the delicious taste of strawberries and cream are perfect as a Valentine’s dessert treat or as a fun accent to your favorite craft or recipe. - PEEPS® Cherries Drizzled and Dipped in Chocolate: Three cherry-shaped marshmallow flavored cherries dipped in and drizzled with decadent chocolate, perfect for sharing with that special someone. - PEEPS® Vanilla Crème Flavored Marshmallow Hearts: Nine vanilla crème flavored marshmallow hearts sprinkled with red flecks are a perfect snack to share, or delicious as a fun topper for hot cocoa. - PEEPS® Chocolate Covered Raspberry Flavored Heart: Individually wrapped raspberry flavored marshmallow heart covered in milk chocolate makes for a treat you can keep to yourself or share with your Valentine! - MIKE AND IKE® Passion Mix Candy: Feel the love of the season with the limited edition MIKE AND IKE® Passion Mix – a fruity and chewy assortment of Paradise Punch, Strawberry, Grape and Cherry in festive holiday colors. - HOT TAMALES® Fierce Cinnamon Candy: Spice up the special day with the original bold and fiery flavor of HOT TAMALES® Fierce Cinnamon! The festive box features a personalized tag – perfect for gifting in the box or using to craft something spicy for your favorite “HOTTIE”. - HOT TAMALES® Valentine’s Lollipops: If you’re feeling extra bold and spicy this Valentine’s Day, the HOT TAMALES® Valentine’s Lollipops are sure to deliver! Available in circle and heart shapes, this fiery treat is a cinnamon-lovers dream! - PEEPS® Plush Valentine’s Day Bunny: These fluffy 5-inch bunny-shaped plushes are squeezable and soft – perfect for hugs and cuddles. Available in red and pink, with a stitched heart that will show a special someone how much you care. 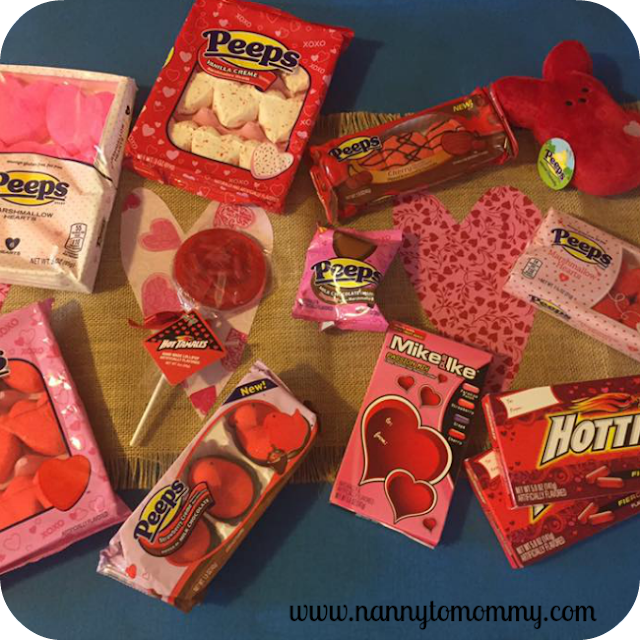 One lucky Nanny to Mommy reader will win a variety of (5) five PEEPS & COMPANY® products to use as Valentine's goodies! Entry is simple. Just follow the prompts on the Rafflecopter below. Open to US only, must be 18+ to enter. Make sure to follow us on Facebook so you can stay up to date with our current giveaways. Good luck! I received complimentary products for the purpose of review. All opinions are my own. Nanny to Mommy is not responsible for sponsors who do not fulfill prizes. This giveaway is open to US only, must be 18+ to enter. Cannot be shipped to P.O. boxes. One entry per household/IP address. No social media was involved in this giveaway in any way. Winner is chosen via Random.org through Rafflecopter. ALL winning entries ARE verified. Winner will have 48 hours to respond with all information in email or another winner will be chosen. If you would like to see your product featured in our upcoming Baby Shower Gift Guide or sponsor a giveaway event, please contact us. 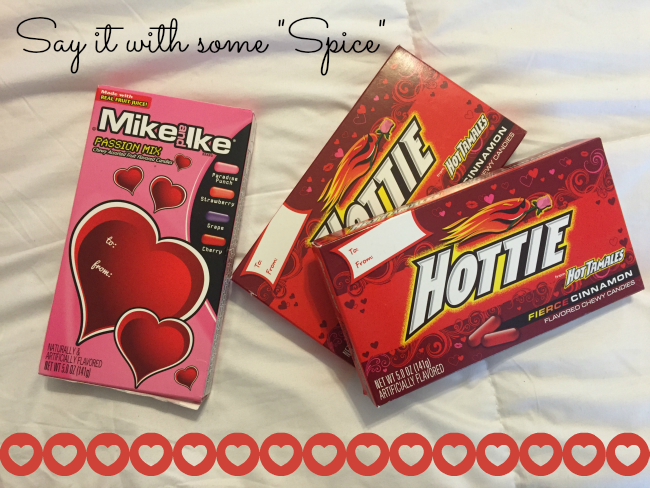 I'm really excited about the HOT TAMALES® Valentine’s Lollipops. I would share it with my nieces. 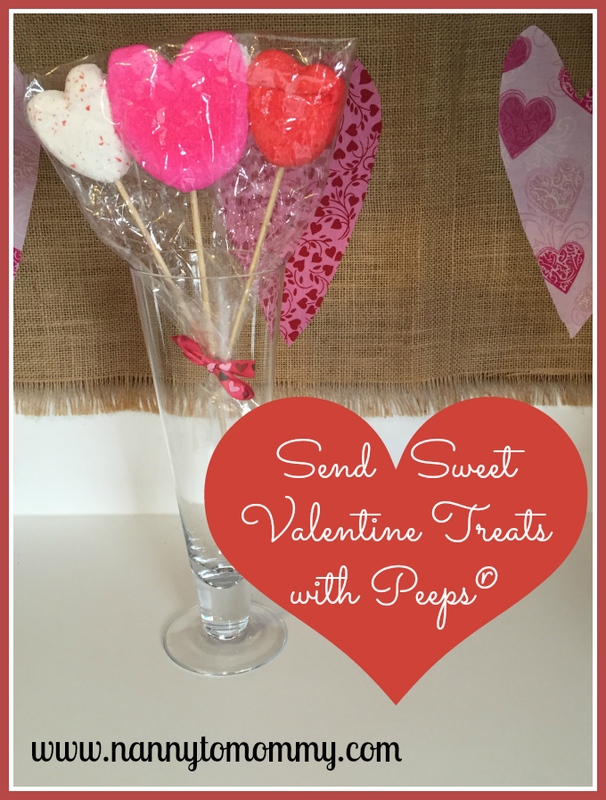 I'd love to try the PEEPS® Vanilla Crème Flavored Marshmallow Hearts! Im most excited to try the cherry chocolate peeps!! I would share with my son!! I am most excited to try MIKE AND IKE PASSION MIX! I would share with my nieces and nephews. Thank you for the chance to win! I am most excited to try the Vanilla Creme Marshamllow Hert Peeps! I would share with my honey, Mr. Undefineable, because he enjoys those red hot thingies! My first big prize when I got into sweeping was a full size surfboard from Hot Tamales. I'm most excited to try PEEPS MILK CHOCOLATE COVERED RASPBERRY MARSHMALLOW HEART. I would share the love with my sweetheart. I want to try the Raspberry Marshmallow hearts. I would share with my kids. I am most excited to try the PEEPS CREAM FUDGE DIPPED RED VELVET MARSHMALLOW CHICKS 3 CT, yummy!! I would share with my hubby and kiddos! I am most excited to try the PEEPS MILK CHOCOLATE COVERED MARSHMALLOW. PEEPS® Cherries Drizzled and Dipped in Chocolate look and sound good. I would like to try the Marshmallow Hearts and share them with my husband and three sons! I am partial to their chocolate dipped varieties, so the milk chocolate covered raspberry marshmallow heart would be my first choice. I like their apparel items and had to smile at the PEEPS BUNNY SHOELACE ACCESSORY- PINK. My granddaughter would love. I'd like to try the chocolate dipped marshmallow chicks with my daughter. I would like to try the Peeps Mini Hearts and i would share them with my children. I want to try the new Milk Chocolate Covered Raspberry Marshmallow. I would love the PEEPS CREAM FUDGE DIPPED RED VELVET MARSHMALLOW CHICKS and I would like to share them with my son! The raspberry chocolate heart is right up my alley. I would share the package with my husband, daughter and grandson. I am thinking the Hot Tamales lollipop sounds like it would be great! I would love to give that to my husband! I want to try the Hot Tamales lollipops, I might share this one with my friend or maybe my co-worker. Thanks. My daughter would be most excited to try the strawberry cream peeps and my other daughter would like the Mike Ikes. The Peeps Milk Chocolate Covered Raspberry Flavored Heart candy looks delicious. And I would share with my husband. Thanks for the giveaway! Oh, Baby! We took cherry flavored Peeps® marshmallow and dipped AND drizzled it in chocolate! Each package contains 3 cherry shaped Peeps®. I think my kids and I would love them! HOT TAMALES EARBUD AND CANDY GIFT SET is awesome and great gift for those tweens and teens! I'm most excited to try the milk chocolate dipped strawberry creme chicks...seriously, what doesn't sound good about any part of that? I'd share them with my non-milk-chocolate-dipped chick. Hot Tamales are my favorite candy. Each member of my family would choose a different favorite. If I win, I'll share with my son and my grandsons. I think the PEEPS HEART SHAPED PILLOWS are adorable and I love the colors! Also love hot tamales! I am most excited to try PEEPS CREAM FUDGE DIPPED RED VELVET MARSHMALLOW CHICKS! I would share this with my husband & our two kids!